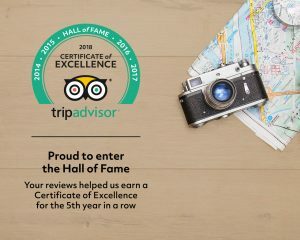 We are very proud to present another Certificate of Excellence from Tripadvisor for 2018 and to enter the Hall of Fame !! A very BIG Thank You for your love and support !! We try our best to get better and better every year and this is definitely motivating us to continue our hard work so as to meet your expectations each time !! Thank you again all ! !